Wooden swift, ready for action! and pulled the “mashed potato” stool into place. 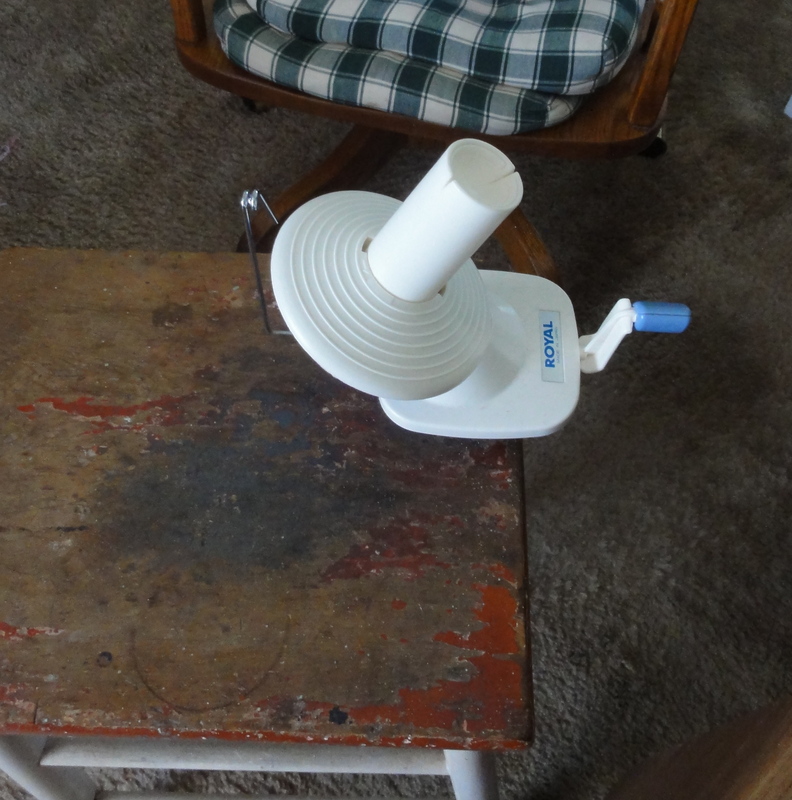 My ball winder is at home atop the “mashed potato” stool. 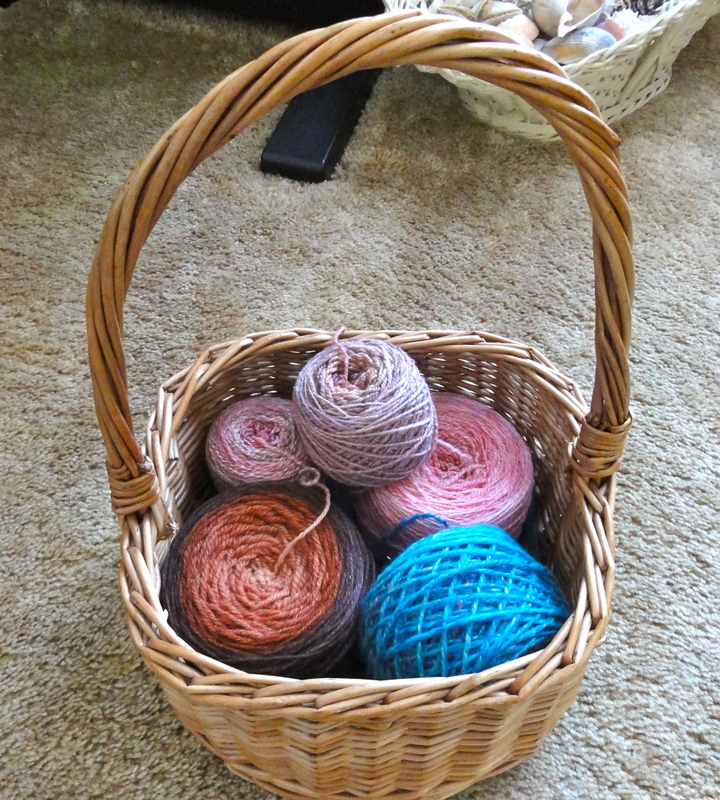 After getting the swift set up and the ball winder in place, I wound some of my handspun yarn into yarn cakes. A basket of yarn cakes. Yum! Each yarn now has a designated knitting project assigned to it. is designated to become a pair of fingerless mitts. I haven’t decided for certain, but I’ll probably use a simple 2 x 1 or 3 x 1 ribbing and keep it very plain so that the beauty of the yarn will shine through. The yarn has a lot of shine, sparkle, color, and texture. It’s a bit thick and thin, and a little slubby, so I plan to keep it simple. 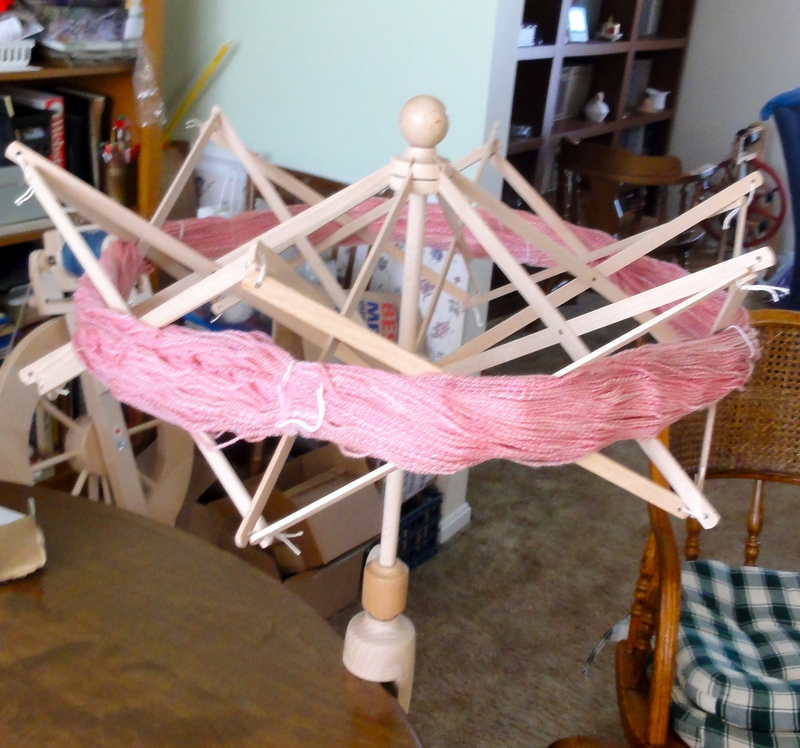 I hope it’s as much fun to knit as it was to spin. Vintage Roses from Corgi Hill Farm will become a Downtown Cowl. that is now this beautiful yarn cake. This yarn needs a pattern that is suitable for a gradient yarn, and I think The Age of Steam and Brass is perfect. Mitt #2 is well underway. and probably cast on yet another pair of fingerless mitts. They are so quick and easy, and very satisfying to knit. And even better, they are wonderful to wear. If you’ve never worn a pair, give them a try. I think you will love them as much as I do. And if you have never knitted a pair… Do. It. NOW. And be sure to visit Tami’s WIP Wednesday to see lots of other hand-crafted goodies. This entry was posted in Fingerless Mitts, Knitting, lace scarves, Shawls, Spinning and tagged BohoKnitterChic, Corgi Hill Farm, Downtown Cowl, fingerless mitts, handspun yarn, knitting with handspun yarn, Spinneretta's Studio, The Age of Steam and Brass Kerchief, winding yarn, WIP Wednesday, yarn cakes. Bookmark the permalink. I love your yarns, they’re beautiful! The steam and brass shawl looks like it would be fun to knit. I just made three pairs of finger less mitts, and they are so satisfying to knit. Thanks. I really enjoy spinning. And I think the Age of Steam and Brass pattern will show off the gradient quite nicely. I think fingerless mitts are as much fun to knit as socks, but they take a lot less time.